Are you currently living in Fresno? Is your wine cooler not working as good as before? If yes, Fresno wine cooler repair is here to repair it for you. Our company has over 15 years of experience and is capable of repairing every wine cooler problem. Are you interested? Then contact us via our online scheduling system or just call us at 559 960 0798.We provide same day service. All of the replacement parts are provided by Fresno wine cooler repair and all replaced parts have a 3-year warranty. What problems can Fresno wine cooler in CA repair fix? The answer is every problem. Our experience allows us to be specialized in repairing wine coolers. Some common problems of wine coolers are mentioned in the list. Moreover, our technicians will provide you with reliable repair so you won’t have to worry about it breaking anytime soon. They are licensed professionals and have experience of many years. Furthermore, our techs can repair any type and brand of wine coolers. Some of the brands are in the following list. Do not hesitate to call us if you cannot find the brand of your wine cooler. 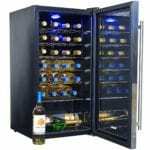 We are specialized in fixing every type and brand of wine coolers. Dial 559 960 0798 or contact us by our online scheduling service and we will be at your door shortly. Why is Fresno wine cooler repair the best?